According to the International Housewares Association, 2,115 exhibitors attended this year’s event, representing 46 countries. This included 442 new exhibitors and over 10,000 new products on display. One company that featured several new products was Quickie Manufacturing Corporation (Quickie), a North American manufacturer of cleaning tools and supplies since 1950. “We have been aggressive in the new product pipeline,” Quickie Vice President of Marketing Carlos Navarro said, while interviewed at the company’s booth during the Housewares Show. “It’s important to keep up with consumer trends. Right now we are focusing on consumers who are getting used to smaller living spaces." In response, Quickie is developing smallware cleaning products under the Lysol® brand that provide “2-in-1” features. These products are designed for kitchens, bathrooms and other living spaces where continuous upkeep is a must. Product versatility is the key. “These are quality products that come with an attainable price,” he added. Household sponges also play an essential role in keeping areas clean. According to Navarro, the top concern among many people who use sponges is the foul odor that can develop after use. To solve this problem, Quickie’s Lysol® brand kitchen sponges are infused during the manufacturing process with a proprietary compound that inhibits the growth of bacteria. The compound will not wash away during use, he added. Providing such product innovation is vital for manufacturers of cleaning products as they strive to keep up with emerging trends and changing customer demands. Quickie officials conduct in-depth consumer research to better understand changes in cleaning needs and habits. Navarro said this goes beyond simple online surveys and cognitive research. “It’s important to put in the extra effort to find what consumers really need,” he said. “This involves providing value, and value doesn’t mean ‘cheap.’ Value can come in the form of increased functionality and versatility in a tool. A greater number of today’s consumers are looking for cleaning products that can help them perform more than one type of job. With some of our pushbrooms, for example, we have added additional features such as scraper edges. Quickie is headquartered in Cinnaminson, NJ, with manufacturing facilities in North Carolina, Texas and Mexico. The company designs, manufactures and distributes 1,000-plus cleaning products for traditional in-home use, do-it-yourself projects and commercial/contractor-grade applications. Its product line includes mops, upright brooms, pushbrooms, smallwares, sponges, dusters, dust pans, brushes and buckets. Brushes play a vital role in keeping surfaces clean throughout the house and beyond. Keeping these products “fresh” for consumers remains a key objective for domestic manufacturer Brushtech Inc., of Plattsburgh, NY. Since its founding in 1976, all Brushtech products have been produced at the company’s upstate New York facility. 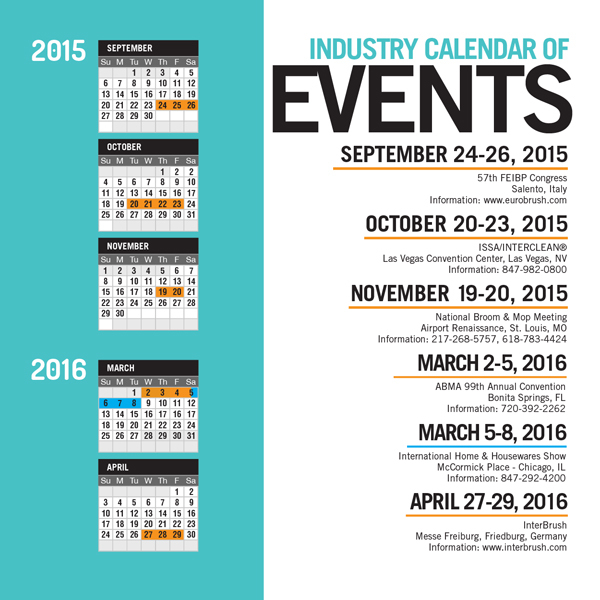 It has also been a regular exhibitor at the International Home & Housewares Show. A key reason for the company’s long participation is to showcase new innovations, and gain a better understanding of customer needs, Brushtech Vice President of Sales Zaven Gunjian said. 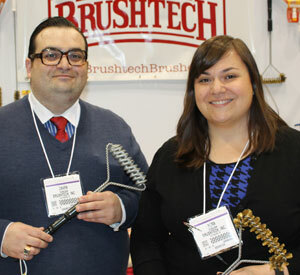 Gunjian’s sister, Brushtech CEO Nora Gunjian, added that events, such as the Housewares Show, provide opportunities for the company to introduce unique brush-related products to new people. This is important since Brushtech officials spend a lot of time thinking about, developing and introducing new items. “We don’t want to get into the commodity brush business, where people specialize in differentiating their brushes via different colors and sizes. We prefer to make products that feature different uses and designs,” Zaven Gunjian said. Because of this, innovation plays a crucial role in product development at Brushtech. As soon as a new type of brush starts to do well for the company, copycats often appear from other sources. Therefore, it’s important for companies, such as Brushtech, to remain one step ahead with new items. “The copycats are unstoppable, and they are going to undercut us on price every time. We don’t bother fighting with them. Instead, Brushtech strives to excel in new product development,” Zaven Gunjian said. “We are not interested in price wars, but rather innovation. Adding an extra twist, different bent and/or using different material for a brush can make all the difference in the world. 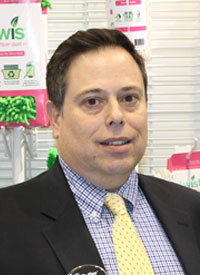 This focus was evident at Brushtech’s booth during this year’s Housewares Show. Many of the products displayed by Zaven and Nora Gunjian were recently introduced, including a new sponge brush designed to better clean dishes and eating utensils. “I was watching a friend wash dishes, switching between a brush and sponge over and over again. I started thinking, ‘We can cut the time to clean dishes in half,’” Zaven Gunjian said. In response, Brushtech developed a new sponge and brush all-in-one product. “The sponge will absorb water, but will not become limp or soggy, while the brush itself performs the bulk of the hard cleaning work,” Zaven Gunjian said. Another product displayed at Brushtech’s booth was a newly designed two-spring, twisted-in-wire barbecue grill cleaning brush. The product features two wire springs taking the place of bristles. “It’s important to avoid bristles falling out when cleaning a grill. They can sometimes get into food,” Zaven Gunjian said. Other new products displayed included foam tip brushes designed for cleaning various types of drinking glasses and cups. Brushtech specializes in producing a variety of unique twisted-in-wire products. This includes brushes designed to clean cooking surfaces; goblets, flutes and decanters; dishes, pots, pans, glasses and mugs; dryer vent ducts and lint traps; microwaves, refrigerator coils and dishwashers; toilets, clogged sink drains and food waste disposals; hummingbird feeders; laboratory glassware; and outdoor furniture. Overall business at Brushtech has been good. In fact, additional employees have recently been hired to help the company keep up with demand. Hiring more people, according to Zaven Gunjian, remains a substantial move for any small brush manufacturer. Brushtech was founded by Nora and Zaven Gunjian’s father, the late Armen Gunjian, and the company remains very much a family business. “My sister and I have been thinking about brushes pretty much our entire lives,” Zaven Gunjian said. For the 24th year, officials at Wool Shop have been showcasing the company’s lambswool cleaning tools and other items at the Housewares Show. This includes wool dusters, floor mops, telescopic dusters, ostrich feather dusters and specialty cleaners/dusters. All of its products are made in Grant City, MO. Wool Shop, located in the northwestern section of Missouri not far from the Iowa state line, evolved from a family-farming operation that includes a flock of commercial breeding sheep. “We (as a company) are part of the same farm that members of my family have grown up on,” Andrews said. “Growth has come over the years by listening to customers and gaining their feedback. Andrews reported that business in general has been good for Wool Shop, but feels the economy in many areas of the United States has failed to fully rebound from The Great Recession. Away from the family business, Andrews’ life took a new turn in November 2014 when he won election as a Missouri state representative. He said the experience thus far has been very rewarding. “I feel my involvement in small business has provided me with insight as to what is needed with new legislation. I am all for the free market system,” Andrews said. Offering a variety of well known brands that include Clorox®, Mr. Clean®, Dawn® and Gain®, Butler Home Products continues to grow its product line through innovation. Many of these changes were highlighted at the company’s booth during this year’s International Home & Housewares Show. In existence since 1947, Butler Home Products provides a variety of brush, broom, sponge and related cleaning items for the housewares segment. “We are always looking at ways to make cleaning chores better, easier and faster,” Butler Home Products Senior Vice President of Marketing Michael Silverman said. “Nobody wants to get bogged down with the task of cleaning. We recognize that people are busy. Providing cleaning products that help them do a good job, as quickly as possible, so they can get on with their lives is important. Meeting and exceeding the expectations of consumers is our ultimate objective. Several new product introductions and updates were highlighted at the Housewares Show by Butler Home Products. Many of these items were in the smallwares category, including products under the Clorox brand. “We have Clorox products that feature anti-microbial components to prevent odor-causing bacteria. In addition, our entire Clorox line is being repackaged with an updated look,” Silverman said. He also discussed a new Mr. Clean Bowl Brush & Plunger combination unit. It comes with a caddy that secures both the brush and plunger, and is equipped with a non-slip base. New as well is the Mr. Clean Magic Eraser Handy-Grip with extendible handle; and the revitalization of the Gain dish brand of smallwares that includes scented sponges. Silverman added that Butler Home Products is expanding its line of TWIST™ brand products to the stick goods and smallwares categories. “This brand started with sponges and resonates with eco-friendly consumers. These stick goods feature recycled and reusable materials,” Silverman said. “There is a certain segment of the population that is very eco-conscious. It’s therefore important to provide them with options when it comes to cleaning products. Silverman reported that overall business for Butler Home Products has been good, and that company officials continue to find success by driving sales through different promotional opportunities. With a company history that started in 1908, Armaly Brands® highlighted at this year’s Housewares Show further product development with Brillo®, another well-established name in the cleaning segment. 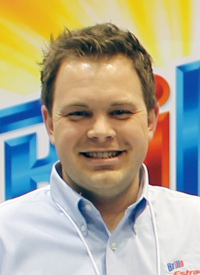 Armaly Brands acquired the Brillo brand in 2010, and company officials have been busy over the past four years adding to Brillo’s product lineup, according to Armaly Brands Assistant Marketing & Brand Manager Eric Phillips. Other new products featuring the Brillo brand include the Brillo Sweep & Mop 3-in-1 cleaning tool, which utilizes Estracell technology with disposable dry pads that sweep, disposable wet pads that quickly clean and thicker pads that deep clean; and the Brillo Erase & Wipe with Estracell sponge technology, featuring a 2-in-1 cleaning pad designed to erase marks and clean around the home. A white section of the product contains its erasing side, while its purple section is an Estracell sponge layer to help users wipe away erasing residue. “These products feature innovation and added-value for consumers while cleaning around the home,” Phillips said. “Estracell’s proprietary technology, for example, helps us produce a more sanitary sponge, improving the overall health and wellness of consumers and their living spaces. He added that officials at Armaly Brands remain focused on changes taking place in the cleaning marketplace, while reviewing sales numbers and looking at the overall competitive landscape. Innovation will remain integral to future growth at Armaly Brands, according to Phillips. “For example, we continue to address which categories will be a good fit in the future for the Brillo brand. The goal is to always add value for consumers, and help them address their cleaning needs during today’s hectic pace,” he said. “We are constantly tossing out ideas and seeing where these ideas will lead. Showcasing several product launches was a major objective for representatives of Freudenberg Household Products (FHP O-Cedar®) during this year’s International Home & Housewares Show. 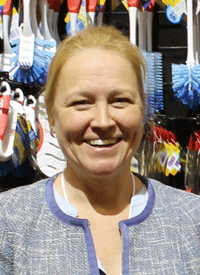 The new products highlighted the importance of putting advanced technology to work for the purpose of better cleaning, according to FHP O-Cedar® Brand Manager Cheri Schmidt. New items introduced by FHP O-Cedar® included its 3-D Smart Mop system as well as a Quick Wring Bucket, featuring a bionic wringer and funnel. Schmidt said the product is good for picking up hair and small particles found on the floor. Meanwhile, the FHP O-Cedar® Micro Twist Mop features soft microfiber that is designed to not damage floors. The product includes easy-to-change refills. “A lot of consumers have what we refer to as ‘refill anxiety.’ This product’s head easily twists on and off. The refills are usually sold next to the actual product,” Schmidt said. Also launched by FHP O-Cedar® was a smallwares line featuring silver ion technology for improved anti-bacterial qualities. These products also include “beefed-up” handles for better gripping. The final new product that Schmidt discussed was the company’s Scrunge® scrub sponge, made of non-scratch polyurethane. It comes in two types: multi-use and heavy-duty. “The traditional cleaning tools segment is growing. It’s being driven, in part, by the deck mop segment. FHP O-Cedar’s® spin mop products are helping with this growth. We are seeing increased sales, and overall business has been good,” Schmidt said. As a regular Housewares Show exhibitor, she added the annual event allows FHP O-Cedar® officials to regularly meet with key buyers, who like to view the company’s entire line of products at one setting. 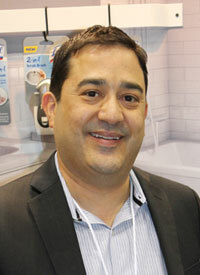 “The show also helps us keep track of trends taking place in the overall cleaning tools market,” Schmidt said. Import totals for January 2015 were down in four finished goods categories outlined: brooms of broom corn valued at more than 96 cents, toothbrushes, paintbrushes and upright brooms, compared to January 2014. The United States imported 28,701 kilograms of hog bristle during January 2015, down 45 percent from 52,081 kilograms imported during January 2014. China sent all of the	hog bristle to the United States during January 2015. The average price per kilogram for January 2015 was $16.12, up 72 percent from the average price per kilogram of $9.38 for January 2014. The import total of broom and mop handles to the United States during January 2015 was 1.3 million, up 8 percent from 1.2 million for January 2014. During January 2015, the United States received 602,490 broom and mop handles from Brazil, 362,528 from China and 270,146 from Honduras. The average price per handle for January 2015 was 89 cents, up 1 cent from the average price for January 2014..
During January 2015, 279,685 brush backs were imported to the United States, down 29 percent from 393,059 for January 2014. Sri Lanka shipped 142,746 brush backs to the United States during January 2015, while Canada sent 121,363. For January 2015, the average price per brush back was 55 cents, up 25 percent from 44 cents for January 2014. The import total of metal handles to the United States during January 2015 was 2.2 million, up 38 percent from 1.6 million for January 2014. During January 2015, Spain exported 1 million metal handles to the United States, while China shipped 925,672. The average price per handle for January 2015 was $1.07, down 7 percent from the average price for January 2014 of $1.15. The United States imported 544,272 brooms of broom corn valued at more than 96 cents per broom during January 2015, down 10 percent from 607,245 for January 2014. Mexico shipped 536,288 brooms to the United States during January 2015. The average price per broom for January 2015 was $2.40, down 6 percent from $2.54 for January 2014. The import total of brooms and brushes of vegetable material to the United States during January 2015 was 433,898, up 269 percent from 117,554 for January 2014. Sri Lanka exported 296,152 brooms and brushes to the United States during January 2015. The average price per unit for January 2015 was 92 cents, down 54 percent from the average price recorded for January 2014 of $2.02. The United States imported 80.3 million toothbrushes during January 2015, down 3 percent from 83.2 million imported during January 2014. China sent 57.5 million toothbrushes to the United States during January 2015. The average price per toothbrush for January 2015 was 25 cents, up 19 percent from 21 cents for January 2014. During January 2015, 3.5 million hairbrushes were imported to the United States, the same as for January 2014. All the hairbrushes were imported from Mexico. For January 2015, the average price per hairbrush was 27 cents, down 1 cent from the average price for January 2014. The United States imported 8.2 million shaving brushes during January 2015, up 3 percent from 8 million imported during January 2014. Germany sent 4 million shaving brushes to the United States during January 2015, while China shipped 2 million and Italy exported 1.4 million. The average price per shaving brush for January 2015 was 10 cents, down 29 percent from 14 cents for January 2014. The import total of paint rollers to the United States during January 2015 was 4.7 million, up 12 percent from 4.2 million during January 2014. China sent 3.6 million paint rollers to the United States during January 2015. The average price per paint roller for January 2015 was 50 cents, down 19 percent from the average price recorded for January 2014 of 62 cents. U.S. companies imported 12.9 million paintbrushes during January 2015, down 29 percent from 18.1 million recorded for January 2014. China shipped 12.1 million paintbrushes to the United States during January 2015. The average price per paintbrush for January 2015 was 42 cents, up 11 percent from 28 cents for January 2014. 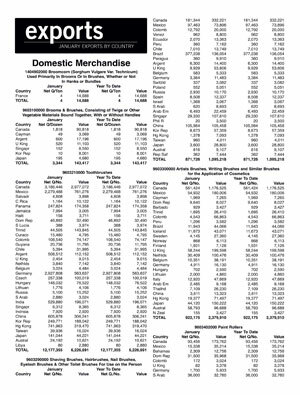 The import total of upright brooms to the United States during January 2015 was 1 million, down 29 percent from 1.4 million during January 2014. China sent 819,208 upright brooms to the United States during January 2015. The average price per broom for January 2015 was $1.64, up 11 percent from the average price recorded for January 2014 of $1.48. Export totals for January 2015 were down in four categories outlined: brooms and brushes of vegetable materials, toothbrushes, shaving brushes and paintbrushes compared to January 2014. The United States exported 3,344 dozen brooms and brushes of vegetable materials during January 2015, down 49 percent from 6,531 dozen for January 2014. The United States sent 1,818 dozen brooms and brushes to Canada during January 2015. The average price per dozen brooms and brushes for January 2015 was $42.89, up 30 percent from the average price per dozen for January 2014 of $32.90. The United States exported 12.2 million toothbrushes during January 2015, down 12 percent from 13.9 million exported during January 2014. The United States exported 3.2 million toothbrushes to Canada during January 2015, while sending 2.9 million toothbrushes to Germany and 2.3 million to Mexico. The United States exported 871,726 shaving brushes during January 2015, down 60 percent from 2.2 million during January 2014. Brazil imported 377,238 shaving brushes from the United States during January 2015, while Canada received 181,344 and China imported 105,984. The average price for January 2015 was $1.26, up 91 percent from 66 cents recorded for January 2014. During January 2015, the United States exported 922,175 artist brushes, up 44 percent from 641,188 for January 2014. Canada received 561,424 artist brushes from the United States during January 2015. For January 2015, the average price per artist brush was $2.58, down 32 percent from the average price for January 2014 of $3.78. ﻿The export total of paintbrushes from the United States during January 2015 was 82,833, down 3 percent from 85,751 for January 2014. Canada imported 50,590 paintbrushes from the United States during January 2015. The average price per paintbrush for January 2015 was $15.83, down 5 percent from $16.64 recorded for January 2014. Technical training, networking and fun activities were all part of ZAHORANSKY's strategic sales meeting. Over three days, approximately 50 members of the ZAHORANSKY global sales organization recently met in Freiburg, Germany, for a strategic sales meeting. In attendance were representatives from subsidiaries in Hong Kong, Shanghai, Kobe, Delhi, Logroño and Chicago, as well as sales agencies from Latin America, Europe, Africa, Eurasia, Asia and Australia. Joining ZAHORANSKY’s headquarters’ sales team, they set directions for the future. 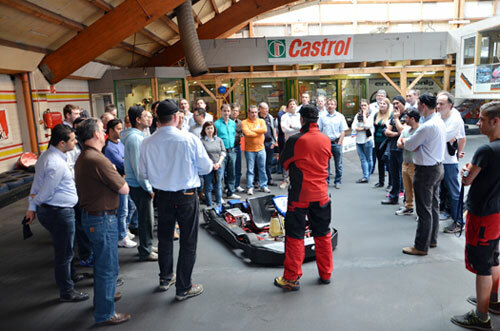 Comprehensive technical training and market studies were also conducted, as well as time for networking and fun. 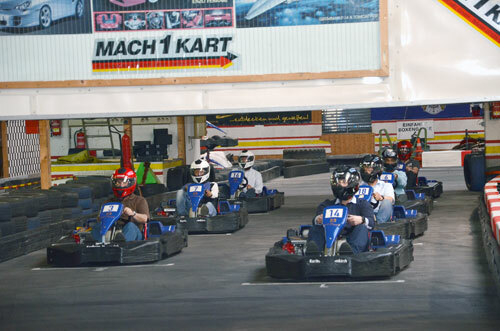 “ZAHORANSKY has always been a very competitive company, and this was demonstrated during fast and tough races on a go-kart racing track, showing ‘ZAHO’s’ really do have racing fuel running through their veins,” said ZAHORANSKY representatives. The manufacturer of machinery, production lines, automation systems and molds for the brush, packaging and plastics industries said it will further focus on its international business development strategy, and expansion of the production plants in India and Spain. ﻿“Powdered-metal parts, still in the ‘green state,’ are much less expensive to deburr than the same parts after they are hardened in the sintering process,” according to Abtex. 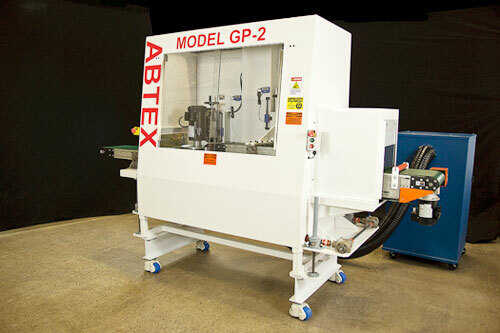 The company's new deburring machine uses Abtex brushes in a configuration that deburrs opposite sides of any part in a single pass. • Built on casters for easy movement around the manufacturing floor. Mauricio Mazzoni, Zuleica Galietto and Ricardo Budiski. A press release from the newly-formed company Borghi Brasil Comercial de Peças e Acessorios para Máquinas Ltda stated, “Maurizio Mazzoni EPP company’s industry experience started with its representation of OSMAS 3 and has continued, since 2004, with Borghi SpA. This has ensured a high level of technical expertise with the entire range of machines produced and sold in Brazil during these years with the brands Borghi, OSMAS, MASS, Techno Plastic and UNIMAC. 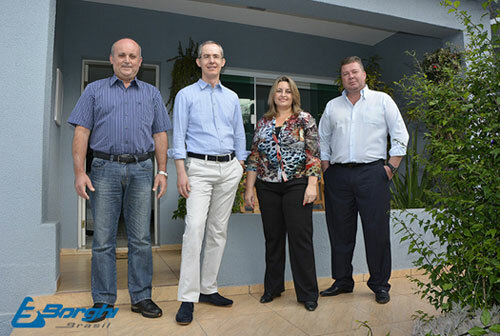 The goal of Borghi Brasil, according to the new company, which officially started in January 2015, is to offer — in addition to the 250 machines currently working in Brazil and new ones — fast and affordable technical support, and, with the increase in stock, to ensure that mechanical and electronic spare parts are always available.The offices have been completely renovated, increasing the commercial area and creating a large space, both for maintenance service and customer care. The staff is comprised of skilled technicians, trained at the headquarters of Borghi SpA, in Italy, who have at least 10 years of experience on all machines sold in Brazil. 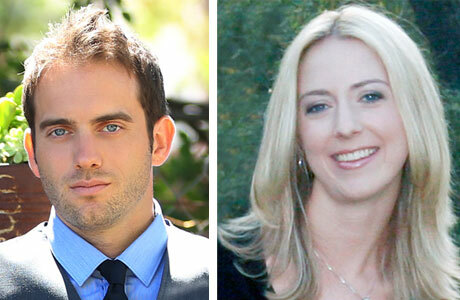 Pictured are new president Grant Fowlie and new executive vice president Heather Jones. Brush Research Manufacturing Company, Inc., has announced two management changes. Grant Fowlie has been promoted to president of Brush Research. He has been with the company for 12 years, most recently as vice president where he oversaw customer relations and fulfillment. 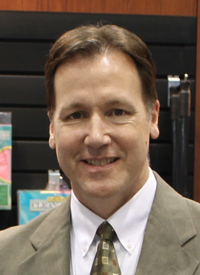 Fowlie now oversees all of the company’s business including sales, production and strategic planning. The company also has promoted Heather Jones from vice president of marketing to executive vice president. Jones is now responsible for marketing, domestic and international sales, customer service and administrative functions. She has been with the company for 10 years. Brush Research, of Los Angeles, CA, specializes in deburring and surface finishing technology. Visit www.brushresearch.com for more information. The Braun Brush Company has purchased Silber Brush Company, of Philadelphia, PA. The Silber Brush Company was started by Ernest W. Silber in 1929. The company manufactured specialty brushes, primarily for the bakery and brewery industries. Ernest Silber passed the business to his son, Kurt Silber. In 1987, Bob Buraczyk purchased the business from the Silber family. His background is in printing, electronics and rigging. He maintained the company focus on manufacturing hand-set brushes for the automotive and window wash industries. Braun Brush has manufacturing facilities in Albertson, NY, and Brentwood, CA. Silber Brush manufacturing has been moved to the New York facility.